Through our website dekratomshop.nl you can order fresh and high quality kratom powder. Our kratom powder is harvested in Central Kalimantan (Palangkaraya area), Kapuas Hulu or Kabupaten (West Kalimantan) and Sumatra (Riau). We buy our kratom powders STRAIGHT FROM THE HARVESTERS in Kalimantan and Sumatra. Our harvesters have been hand-picked by ourselves after a long vetting and selection process. Each year we go to Indonesia (Kalimantan) to visit our producers to keep them keen and to find and try new exciting Kratom strains for our shop. I discovered kratom in 2011 for the first time during one of my stays in Indonesia. Since 1994 i spend mostly every year half of my time in Indonesia and half of my time in The Netherlands. I had been suffering from depression on and off since 2001 and often during my stay in Jakarta i would get depressed due to the intensive and busy lifestyle in the big Durian. It is a huge city (probably one of the biggest if not the biggest in SE-Asia) and i developed a kind of love-hate relationship with the city. On the one hand i love being there and enjoying all the things the city has to offer and on the other hand i hate it due to the stress, smog, pollution, traffic and intensity. My webdesign business and my side business in teaching were mainly focussed on Jakarta so i had to be there most of the time i was in Indonesia each year, otherwise i would most likely have tried to spend my time in for example Bali. In 2011 i was in Jakarta also and slipped into a very serious depression. It is very hard to live in such a big and wild city with a depression, i was ready to pull the plug and get a ticket and go back to Holland when i met somebody by chance. I told this person about my depression and anxiety (i had developed social anxiety due to my depression as well) and he could feel i was not well at all. He told me about this herbal thing called “Kratom” and told me to try it out, it could perhaps help me he said and who knows, i would not have to go back to The Netherlands. I went with him to his Kos (boarding house) where he made me a kratom with hot coffee and lots of sugar. It tasted of course horrible for me and i nearly had to vomit but i managed to keep it in. That night i went to bed and could not sleep, i was restless and had the feeling i should go out and do lots of things, i felt i had loads of energy and for the first time in about 3 weeks (since my depression had become severe) i felt actually happy again. I went out of bed, and took a shower put on some good clothes, sprayed on a nice scent and went out to a cafe or pub. I managed to talk to the other patrons and they actually enjoyed me being there and talking to them. Before during my depression i also went out sometimes but was so depressed and unhappy and emitted such a negative vibe that people avoided me which made me even feel more depressed and miserable. I made some new friends that night and went back home almost reborn. I am not saying i was cured from my depression during that stay in Jakarta in 2011, the depression would still be there and i would still have bad days and nights but i started using kratom every day and night since i got introduced to it (the guy generously gave me about 500 grams, enough to last me a month and after it was finished i would get more), and it helped me to slowly get out of the depression and to not have to suffer too much from it. Every morning i woke up the mere thought that i could take some kratom again that day would lift my spirits and make me able to get out of bed and do my things. Before that when the depression was bad, the waking up would be one of the worst parts of the day knowing i had to go through another day again, getting out of bed would be a very difficult thing (i think people suffering from or having suffered from depression will know what i mean by that). Anyway kratom helped me to function again and in 2013 i decided to open my own webshop and try to sell kratom too, one of my big motivations for that was the fact i really had come to love the product and i wanted to share it with as many people as possible. After we recieve your order and after your bank transfer has been confirmed we will usually ship your order within one day. If shipping cannot be done within the next day we will inform you of that. 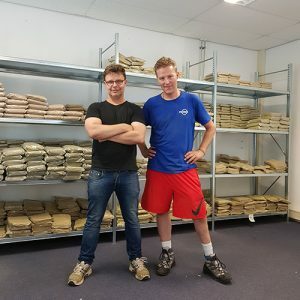 Our kratom is delivered with Postnl in airtight vacuüm seal bags. It is then put in neutral and lightproof air cushion enveloppe or (from 600 gram onwards) put in a box. We despatch from The Netherlands. Perfect for a relaxing evening with friends, or to unwind from a long day at work. Really euphoric at the proper dosage. Highly recommended. Lovely strain, really energising and pleasant! Will definitely buy again. Goede Kratomsoort voor een snelle boost. In tegenstelling tot witte of groene kratomsoorten kickt de Yellow variant sneller in, althans zo lijkt het. Ik nam mijn gebruikelijke dosis van 4 gram zoals bij elke kratom voor mij gewenst is, en op die manier kon ik dus goed vergelijken wat het verschil is tussen yellow, red, white en green Kratom. Aarader is het zeker, voor de afwisseling, maar ook voor bijvoorbeeld een cardiotraining, hardloop sessie of krachttraining vroeg op de ochtend. This was the first kratom is tried, used around 4-5g mixed with protein shake for breakfast, pretty much immediate stimulation, switched on edge, euphoria however not “wired” like caffeine. Really enjoyed this and will try more or a different kind. Also stopped hunger cravings and got stuck in about cleaning the house. Helps kill boredom and in general very enjoyable. Can see this being taken in the morning before getting stuck in about work. Very good and potent strain, very consistent in quality. The first strain I tried from dekratomshop.nl, and I never used an other vendor after. Big thumbs up for the products, costumer-service and delivery-time! This strain can be very relaxing or energizing, depending on the dosage used. Also works very well for managing pain, without having any feelings of “sedation”. Great in energy, fast acting, and quite long lasting in my experience. I would highly recommend this strain! 4 tot 5 gram geeft een milde, rustige werking, wat ik erg fijn vind. Ik neem het eens in de week op een lege nuchtere maag in de ochtend en spoel het weg met lauw water. Na 45-60 min zijn de rustgevende effecten goed merkbaar. Hoger dan 5 gram ga ik niet, omdat ik dan bang bent dat er sedatieve effecten op gaan treden.